﻿ Howie Hayman - Music - Indian Bollywood Music. Bollywood is the informal term popularly used for the Hindi-language film industry based in Mumbai (formerly known as Bombay), Maharashtra, India. The term is often incorrectly used to refer to the whole of Indian cinema; however, it is only a part of the total Indian film industry, which includes other production centers producing films in multiple languages. Bollywood is the largest film producer in India and one of the largest centers of film production in the world. Bollywood is formally referred to as Hindi cinema. There has been a growing presence of Indian English in dialogue and songs as well. It is common to see films that feature dialogue with English words (also known as Hinglish), phrases, or even whole sentences. 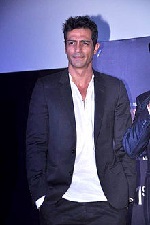 Arjun Rampal (Hindi: अर्जुन रामपाल), (Born 26 November 1972), is an Indian film actor, producer, model and a television host. Through his career in Bollywood movies,he has established himself as a leading actor of Bollywood. 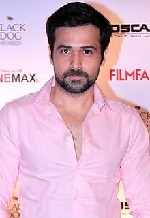 Emraan Hashmi (born 24 March 1979) is an Indian film actor who appears mainly in Hindi language films. Before starting his career as an actor, Emraan Hashmi worked with Vishesh Films as an assistant director on Vikram Bhatt's Raaz (2002). Hrithik Roshan (born 10 January 1974) is an Indian film actor known for his versatility and work ethic in addition to great dramatic range. Ranbir Kapoor (pronounced [rəˈɳbiːr kəˈpuːr]; born 28 September 1982) is an Indian film actor. He is the recipient of five Filmfare Awards, and is a leading actor of Hindi cinema. He is the son of actors Rishi Kapoor and Neetu Singh, and the grandson of actor-director Raj Kapoor. Saif Ali Khan (pronounced [ˈsɛːf əˈli ˈxaːn]; born Sajid Ali Khan on 16 August 1970) is an Indian actor known for his work in Bollywood films. Having made his acting debut in 1992 with Yash Chopra's Parampara, Khan had his first success with the 1994 films Main Khiladi Tu Anari and Yeh Dillagi. 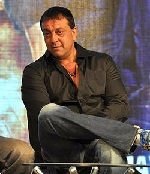 Sanjay Dutt (born 29 July 1959) is an Indian film actor and producer known for his work in Hindi cinema. He was briefly associated with politics and is also infamous for felonies committed during 1993 Mumbai blasts. Shahid Kapoor (also known as Shahid Khattar; born on 25 February 1981) is an Indian film actor. He started his career by working in music videos and advertisements, and made his Bollywood debut with Ishq Vishk (2003) and won a Filmfare Award for Best Male Debut for his performance. 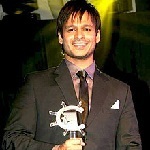 Vivek Oberoi (born 3 September 1976) is an Indian actor. He made his film debut with Ram Gopal Varma's film Company (2002). 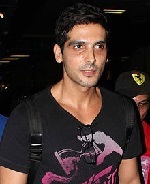 Zayed Abbas Khan (born 5 July 1980) is an Indian actor and producer who appears in Hindi films. He is known for his performance in Main Hoon Na. Aruna Shields is a British model. She debuted in Bollywood with the film Prince. Esha Gupta (born 28 November 1985) is an Indian actress who appears in Bollywood films. A model, she came 3rd in Femina Miss India in 2007 and went to compete in the Miss India International contest and was not placed. Kangana Ranaut (born 23 March 1987) is an Indian actress who appears mostly in Hindi films. She made her acting debut in 2006 with a leading role in Gangster. Kareena Kapoor (pronounced [kəˈriːnaː kəˈpuːr]; born 21 September 1980), also known as Kareena Kapoor Khan, is an Indian actress who appears in Bollywood films. She is the daughter of actors Randhir Kapoor and Babita, and the younger sister of actress Karisma Kapoor. Nargis Fakhri (born October 20, 1979) is an American fashion model and actress. She has appeared on America's Next Top Model and made her Bollywood debut with 2011 Bollywood film Rockstar, and consequently starred as a war correspondent in the 2013 political thriller Madras Cafe. Priyanka Chopra (pronounced [prɪˈjaːŋkaː ˈtʃoːpɽaː]; born 18 July 1982) is an Indian film actress and singer, and was the winner of the Miss World pageant of 2000. Shahana Goswami (born 6 May 1986) is an Indian actress who works in the Indian Film Industry. Shahana Goswami was born in New Delhi to a Bengali Origin. Shriya Saran (born 11 September 1982), also known by the mononym Shriya, is an Indian film actress and model. She has acted in Telugu, Tamil, Malayalam and Hindi language films, as well as a few films in English and Kannada. Sonal Singh Chauhan (born on 16 May 1985) is an Indian fashion model, actress and singer. She has won several beauty contests and made her acting debut in the movie Jannat directed by Kunal Deshmukh. Note - The following links are to good songs. Still working on putting these on actual movie pages.